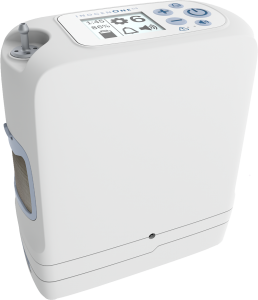 Inogen is pleased to announce the newest innovation in portable oxygen concentrators: The Inogen One G5. The Inogen One G5 is the latest in our Inogen One family of products, offering excellent portability and the ability to get your supplemental oxygen while at home or on the go. The Inogen One G5 builds on the benefits offered by our other Inogen One models. 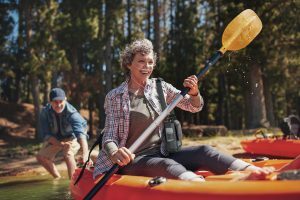 Our portable oxygen concentrators are known for being compact and lightweight, so that you can continue leading the rich and active life you love. The Inogen One G5 has a longer battery life and the highest oxygen output per pound of any portable concentrator cleared for us in the U.S. homecare market. This allows you to take advantage of the versatility you need for your oxygen therapy, and it gives you the ability to stay out and about longer with ease. Inogen’s goal is to offer patients better quality of life with portable oxygen concentrators that are easy to use, portable and do not get in the way of your normal daily life. The Inogen One G5 is our latest addition, and weighs just 4.7 pounds, including the single battery, so you can carry it with you anytime and anywhere. Take your Inogen One G5 with you in the car to run errands, to enjoy a weekend getaway, or on a flight to visit family. The Inogen One G5 meets FAA requirements for flying with a portable oxygen concentrator, making travel worry-free. Measuring just 7.19 inches long, 3.26 inches wide and 8.15 inches tall with the single battery, it is also small enough to easily carry with you and tuck under an airline seat. To make traveling even easier, there is a backpack specifically designed for the Inogen One G5. Whether you’re taking a long trip or you just need something to use for day-to-day purposes, the backpack has space for your system, accessories and more. In spite of its compact size, the Inogen One G5 offers six different flow settings, which gives you the versatility you need to adjust your oxygen treatments however your doctor recommends to better fit with your life. Many patients worry about whether supplemental oxygen will be difficult to use or whether it will make socializing more difficult. Inogen One G5 users do not need to worry, as this portable oxygen concentrator is made to be extremely easy to use, with simple control functions and an easy to read LCD display. Patients who want to use the Inogen Connect App will find it is easy to use as well, allowing you to monitor your oxygen use, battery life and the operation of your unit. Inogen Connect helps you track when certain parts need to be replaced or when your unit needs maintenance, giving you one less thing to think about, along with the peace of mind that your portable oxygen concentrator is working as it should. Inogen Connect also gives you quick and easy access to the user manual, FAQs, troubleshooting tips and more. If you need supplemental oxygen, the Inogen One G5 is your latest solution for oxygen at home, on the go and for travel. It is tested for use 24 hours a day, 7 days a week to keep you breathing better no matter where you are, what you are doing or what time of day it is. Enjoy renewed independence, mobility and freedom in a powerful, light and quiet package. We are proud to introduce the Inogen One G5 to you, and we cannot wait to hear how it improves your daily life. Contact us today to learn more and find out what the Inogen One G5 can do for you. With the Inogen One G5 portable oxygen concentrator, you can enjoy a better quality of life with oxygen anytime, anywhere—it is oxygen therapy on your terms. We'd love to send you an info kit. Can you please call us at 800-695-7915 and provide us with your mailing address? We look forward to hearing from you. Is there some type of water proof back pack or bag out there to allow a person to go wading in a pool with the unit attached to him? Unfortunately, we do not have a waterproof carrier for our units.